Three – year two-way starter at Notre Dame and played all sixty minutes in three games. 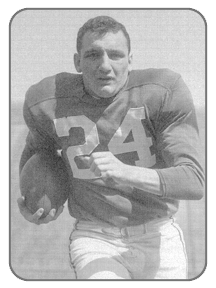 Played in 1955 East-West Shrine Game and 1956 College All-Star Game. Drafted in the Third round by the Philadelphia Eagles in 1956, playing in all 12 regular season games.